Welcome to Crescent Sands of Windy Hill where you can swim in the oceanfront swimming pool, relax on the white sandy beaches and take it easy inside your nicely decorated North Myrtle Beach vacation rental that boasts all of the modern conveniences of home. This North Myrtle Beach resort is welcoming and centrally located. Your North Myrtle Beach vacation will be one to remember when you make reservations for Crescent Sands of Windy Hill. This North Myrtle Beach resort offers updated two-bedroom North Myrtle Beach condominiums. Beautiful on the inside with beautiful views from the outside, these North Myrtle Beach vacation rentals are ideal for a family of four. The two-bedroom North Myrtle Beach condo rentals have two baths. 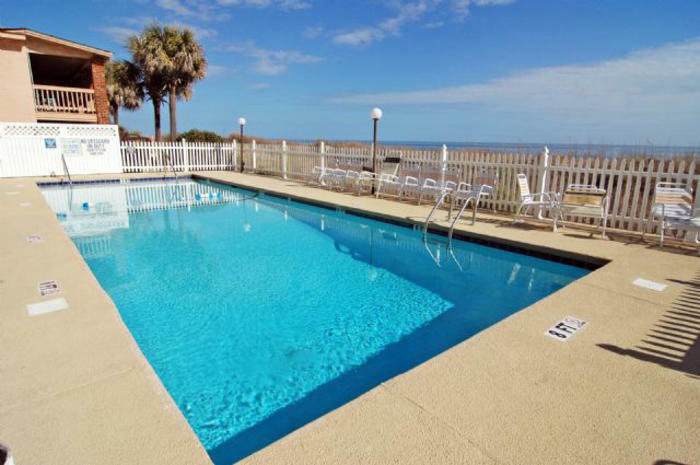 Whether you are bringing the kids to this condo in North Myrtle Beach, SC or two couples will be on this North Myrtle Beach vacation together, each pair can spread out and enjoy a little privacy during your stay at Crescent Sands of Windy Hill. There is a fully furnished kitchen in these North Myrtle Beach rentals. You will be amazed at all the little things provided for you in these condos in North Myrtle Beach, South Carolina. There is a microwave, dishwasher, full-size refrigerator and a breakfast bar in addition to the small appliances like a toaster and coffee pot. You can truly make yourself at home when you are surrounded by such conveniences. Amenities in these condos in North Myrtle Beach, South Carolina include everything from wireless Internet access to a washing machine and clothes dryer. Televisions and DVD players are usually part of the furnishings at Crescent Sands of Windy Hill and you might even find a fireplace in some North Myrtle Beach rentals. These North Myrtle Beach vacation rentals are non-smoking units. The living room in these North Myrtle Beach vacation rentals opens to the oceanfront balcony at Crescent Sands of Windy Hill. The views are spectacular from the living room, dining area and kitchen as they all look seaward. Step onto the balcony and you will immediately be inspired by the postcard-perfect views of the Atlantic Ocean and white sandy beaches. The beaches fill up with families and people taking long walks down the shoreline. Swimmers splash about in the shallow water of the Atlantic Ocean and the sun shines down on everyone. Also from your private oceanfront balcony at this North Myrtle Beach resort you can see the sparkling blue swimming pool. Lounging poolside is a nice way to relax, especially if you have a book or magazines you want to read during your North Myrtle Beach vacation. Just pick a lounge chair and settle in for a few hours of sunbathing where the only thing that is between you and the white sandy beaches is a dune line filled with sea oats. From the pool deck you can immediately get out to the beachfront. Follow the wooden boardwalk and sandy path that leads you through the dunes and out the open beaches. Take a beach umbrella and a couple of chairs to fully kick back on the beach. While a cooler of juice, water and soft drinks is welcome on the beachfront, it is not altogether necessary when you have a refrigerator in your North Myrtle Beach rental. You can run back inside, grab a snack and head back out to the beachfront again in just minutes. Crescent Sands of Windy Hill is just a hop, skip and a jump away from the Cherry Grove Fishing Pier, down the street from the beach clubs of Ocean Drive and around the corner from everything else. It is easy to find shopping, dining, live entertainment theatres and golf courses in close proximity to Crescent Sands of Windy Hill. North Myrtle Beach amusements and Myrtle Beach attractions are found everywhere. Ride the Myrtle Beach SkyWheel and take a spin around the Atlantic Ocean while riding a Sea Doo. How about parasailing along the North Myrtle Beach coastline while being pulled behind a speed boat? Does offshore fishing interest your family? There are deep-sea fishing charters that can take you shark fishing or out to the Gulf Stream. Miniature golf courses are all over and are great fun for all ages. Get an ice cream cone and walk the Myrtle Beach Boardwalk. Rent a kayak and paddle the salt marsh. Find a waterfront restaurant and watch the sunset as you enjoy cocktails. See a show at the Carolina Opry or watch pirates do amazing feats at Pirates Voyage. From a saltwater aquarium and museum of the bizarre to photo ops with tigers and a ghost tour that is filled with local lore, the North Myrtle Beach area has it all as you will soon discover when you arrive for your beach vacation at Crescent Sands of Windy Hill.